At 5:30 a.m., a dense, gloomy fog settled on the ground, making it difficult to see the paved road in front of us. We headed to a destination that had captivated me on Instagram – The Pinnacles located at Cape Woolamai on Phillip Island. After recently spending the weekend here, I couldn’t believe that such a diverse landscape exists so close to Melbourne! Cape Woolamai, just a 90-minute drive away, is dominated by a rugged coastline and extremely steep rocky cliffs and pink granite rock formations known as the Pinnacles. According to the island’s signs, about 360 million years ago, molten rock forced itself up from the earth’s core, cooled very slowly beneath the ground and formed the pink granite which you see today. Mother Nature in the form of ferocious winds and waves gradually exposed this pink granite. Honestly, the granite looked more reddish to me, but perhaps it depends on how the light hits the rocks. Whether the rocks are truly pink or red doesn’t matter as this area is absolutely splendid for anyone who loves landscape photography or hiking. I happen to enjoy both. In fact, I found two websites (Free Photo Guides and Photography Hot Spots) talking about how to find and shoot The Pinnacles. 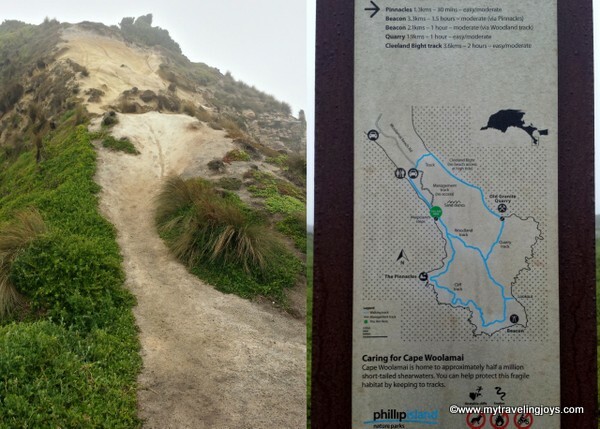 Starting at the cape’s carpark, we followed the expansive, empty beach for about a kilometer and then walked up a set of wooden stairs that lead to the three walking trails. We followed the green markers to The Pinnacles, about 4 km in length and taking about 90 minutes to 2 hours to complete. Along the lush, green landscape, we saw several wallabies and thousands of small snails. Mmm…escargot anyone? At the end of 2km, we reached a wooden bench and The Pinnacles stood in front of us, surrounded by swirling, crashing waves. The fog hung heavy, and we knew that we wouldn’t see a spectacular sunrise. The sun didn’t make an appearance at all, but I still enjoyed taking dozens of photographs here. Watch out as the sea mist will coat your camera lens! Instead of hiking down, we followed another narrow path up the nearby cliffs. I was skeptical and a little worried about the tiny path, but we made it up and were rewarded with a beautiful foggy vista. However, if you are scared of heights, I wouldn't recommend doing this small trail. This is the tiny path my husband made me hike up to the top! This is the section you need to hike down if you want to get to the bottom to take your sunrise/sunset photos at The Pinnacles. After hiking to The Pinnacles, we drove about 2km back down the road to the Forrest Caves car park. (The sign is impossible to see from the road, so double check a local map.) These sea caves have been formed and continue to be shaped by the waves, making it a popular area for local surfers. This is an easy 2km return walk along another beach until you reach the enormous red boulders jutting out of the sand at the end. The caves are located here and only accessible at low tide. Well worth a stop if you’re already in the area. By this point, it was a little after 8 a.m. and we had already been up for 3 hours. We were tired and a bit chilly. After hiking a little over 8km, we headed back to our fantastic campsite to make breakfast, which I’ll tell you about in another blog post.